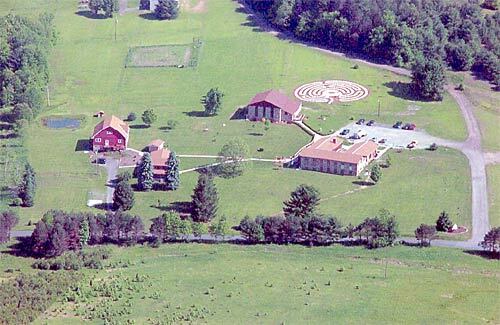 BETHANY RETREAT CENTER was established in 1982 by the Anawim Religious Community of Frenchville, Pennsylvania. It is a place apart to rest, renew and be recreated for those seeking a deeper relationship with God. Located on 140 acres of partially wooded land in the hills of Pennsylvania, the atmosphere is quiet and peaceful — only 15 miles off Interstate 80. 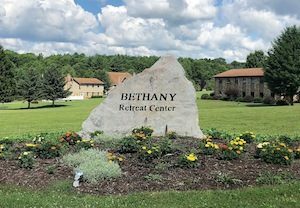 BETHANY RETREAT CENTER offers trails through the woods to the mountain-top cross, outdoor stations of the cross, 102′ x 87′ labyrinth, mysteries of the rosary, and a lovely Marian Grotto for meditation. There are also trails for walking, hiking, and jogging, and the large lawns and gardens create ample space for quiet reflection. There is a spacious dining room, home cooked meals, air-conditioned prayer space, large and medium conference rooms, hermitage space with kitchenette. Perfect for one-day or overnight conferences, retreats, sabbaticals, or private days. When the schedule permits, individuals and groups such as parish personnel are welcome to avail themselves of the prayerful atmosphere of the retreat center for a day or for overnight stays. Arrangements are tailored to the needs and desires of the individual or group. If you are interested in ongoing spiritual direction, call us for more information. Appointments are available on Monday, Wednesday, or Thursday 9am – 7pm. For more information, please call 814.263.4855.